The dusty side of the Sword of Orion is illuminated in this striking infrared image from ESA’s Hershel Space Observatory. 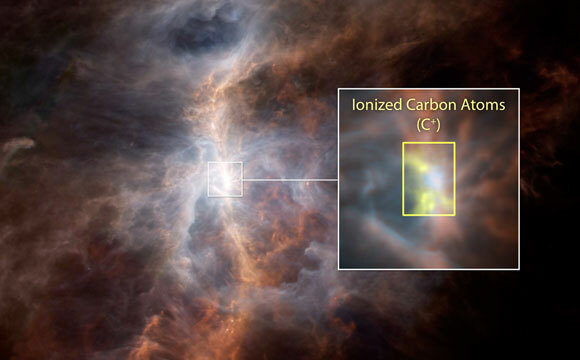 Within the inset image, the emission from ionized carbon atoms (C+) is overlaid in yellow. New research shows that ultraviolet light from stars plays a key role in creating molecules that are necessary for building other chemicals essential for life. Life exists in a myriad of wondrous forms, but if you break any organism down to its most basic parts, it’s all the same stuff: carbon atoms connected to hydrogen, oxygen, nitrogen and other elements. But how these fundamental substances are created in space has been a longstanding mystery. Now, astronomers better understand how molecules form that are necessary for building other chemicals essential for life. Thanks to data from the European Space Agency’s Herschel Space Observatory, scientists have found that ultraviolet light from stars plays a key role in creating these molecules, rather than “shock” events that create turbulence, as was previously thought. 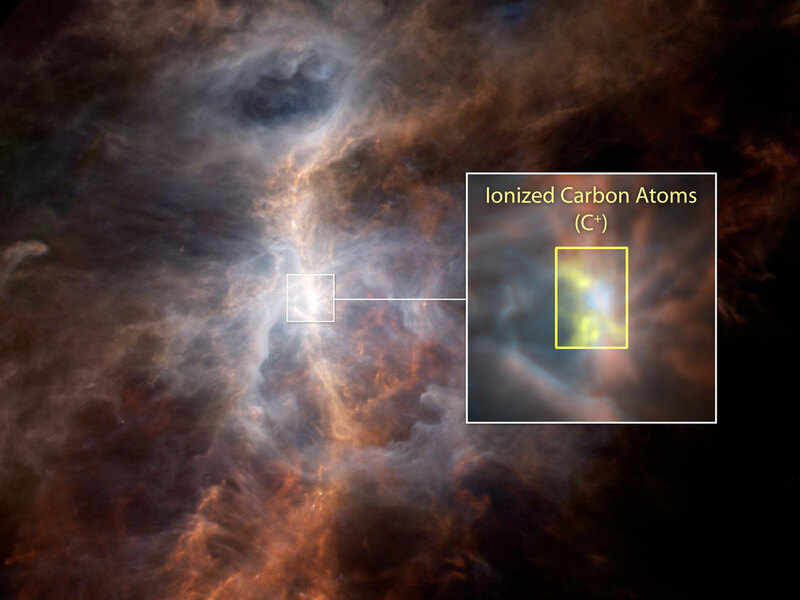 Scientists studied the ingredients of carbon chemistry in the Orion Nebula, the closest star-forming region to Earth that forms massive stars. They mapped the amount, temperature and motions of the carbon-hydrogen molecule (CH, or “methylidyne” to chemists), the carbon-hydrogen positive ion (CH+) and their parent: the carbon ion (C+). An ion is an atom or molecule with an imbalance of protons and electrons, resulting in a net charge. Be the first to comment on "Ultraviolet Light from Stars Plays Key Role in Creating Building Blocks of Life"